Imagine a live whole-of-government exercise with greater than 500 participants intertwined in naval mine warfare within Canada and the USA, irregular migrants from the ‘Dark Continent’ surreptitiously making their way to Canada, coupled with the raising of a shipwreck in Nova Scotia’s Sydney Harbour. Why would anyone develop such an exercise? What would you name it? The admirals – the leaders of Joint Task Force Atlantic (JTFA), United States Fleet Forces (USFF), and the US Coastguard Atlantic (USCGLANT) – are of the belief that should a significant domestic or security event take place near or within their respective shores of responsibility they would reasonably form a team effort in delivering the effects to settle it. Timely delivery of effect for complex missions requires strong organizational relationships in problem solving, planning and mission conduct. Relationships need to be initiated, developed, maintained, and refreshed in a continuum to be effective. To those ends the annual FRONTIER SENTINEL series of exercises was initiated in 2009. This paper will provide an overview of the above described series of events collectively known as FRONTIER SENTINEL 2012 (FS12). The commander of the lead partner (the lead agency rotates with each exercise) directs the primary objectives to be attained for a given annual exercise. JTFA had the lead in 2012 and identified plans for irregular migrants and mine warfare as the two top objectives for FS12. The live exercise – with approximately 60 planners, 500 players, aircraft, and ships – took place in spring 2012 after a year of planning. The mine warfare scenario stressed Canadian and American command and control organizations, crew deployments, inter-agency relationships (inter-agency is a US government term which describes generic US federal departments), and reaction to changing conditions. Utilizing irregular migrant plans (including the Federal Emergency Response Plan – FERP – from Public Safety Canada) opened the doors to Canadian federal, provincial, and municipal partner participation. A vessel impacting a mine in Sydney Harbour, simulated only as planners could not obtain authorization to neither use a real mine nor impact mine a real ship, kicked off the exercise. While there were many great examples of planning and coordination, one of the lower level objectives supporting mine warfare proved exceptionally challenging and exciting when it all came together – the clearing of a sunken vessel from the Sydney Harbour. Raising the 10 year-old hulk of Cape Ann III in Sydney Harbour would meet JTFA exercise objectives through US Navy Mobile Underwater Diving Salvage Unit 2 (USN MUDSU2) with its mission of raising wrecks and clearing navigation channels. Their lead engineer and diver had to consider numerous factors. What was the ship’s condition? Could it be towed? Would ship conditions permit divers to work inside? Would water and tidal conditions permit safe dive operations? What impact would environmental factors have on planning, and execution? What were potential pollution factors? What/how/who would mitigate pollution factors? The shoreline had to be left in better than found condition. The ship was to be raised by the military but disposed of by civilian partners. Would the civilian plan be acceptable to military leadership? The hand off point was determined by clearly defining the meeting of exercise objectives, raising not disposing of the wreck. Permissions from landowners, municipal, provincial, and federal governments to work on their land had to be obtained. And raising the Cape Ann III was only a lower level objective. MUDSU2, the Cape Ann III Society, Cape Breton Regional Municipality (CBRM), and the private sector all provided excellent planners. All participants had a steep learning curve developing an acceptable plan within the rainbow of cultures. Private landowners, military, non-profits, private business, and government all have different methodologies on how to get from A to B given their respective requirements and cultures. Cape Bretoners, at least some, need to know the blood lineage of those they work with before any real work begins even if it means ten minutes of tracking through the respective maternal sides to a common village in Italy! JTFA wanted exact answers and timelines; government planners were concerned with costs and bidding process; private sector wanted to know, ’What was meant by a bidding process? Non-profits were unfamiliar with military command. Military knew command but had to learn collaborative planning. Once the ‘Why is that important?’ questions were understood, planning moved along smoothly. Planners learned from each other, an unintended success. So items such as identifying potential underground hazards before breaking ground, undertaking the bidding process, accommodating recreational users of the area, identifying potential environmental issues and most importantly mitigating them were solved through a collective perspective. Despite the risks no injuries were incurred by any of the parties. 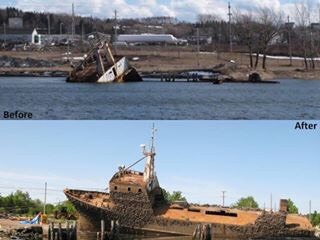 The result was the raising and scrapping of the Cape Ann III with no trace of activity left on the site by August 2012. Cost, cost, cost, who would pay for what, and when? The cost of running an exercise is borne by those who benefit from it, simple. JTFA would absorb the lion’s share of FS12 costs in order to meet the main objectives of studying the irregular migrant and mine warfare plans. USFF would absorb the significant costs of MUDSU2 divers and equipment while achieving their training objectives with Cape Ann III. The USCGLANT and other agencies had deployment costs. Canadian federal (Public Safety Canada – PS Canada, Canadian Border Security Agency – CBSA, RCMP, Health), provincial (Health, Emergency Measures), non-government organizations (Red Cross), all incurred significant cost in planning, set up and leading or running their responsibilities during the events. CBRM, in particular, had to be prepared to support and or help mitigate potential fishing and pollution risks. Again, all offices worked together exceptionally well in ensuring effective budgeting, planning, and shaping of events would maximize exercise value for their respective organization as well as the group as a whole. Public Affairs or PA (as known in JTFA) also known as communications or comms in some government departments (e.g., in RCMP ‘H’ Division) played a significant part in ensuring the exercise objectives of mine warfare and irregular migrants were clearly delivered to the public. Messaging was, ‘Yes, the local area benefitted from the exercise BUT their benefits were incidental to military and government agencies meeting their exercise objectives which was critical.’ The effectiveness of the media relations role could be measured through the positive radio, television, and social media stories describing the various activities around the Sydney area. Internally success was measured by the few negative calls into JTFA. Once those who called in had received an explanation of their respective issue they left with an understanding of the event’s goals. Of interest, a number of calls were fielded from various individuals offering their neighbourhood shipwrecks for removal. In conclusion, hopefully this précis of the events describing FRONTIER SENTINEL 2012 has cracked the door into the why and what goes into planning events to initiate, develop, and maintain relationships critical to providing timely effect to Atlantic Canada and the Eastern US seaboard. The raising of Cape Ann III is an excellent example of international, federal, provincial, municipal, and private sector roles and cooperation. PS Canada, running their Federal Emergency Response Plan using an irregular migrant plan, provided the fabric for a whole-of-government domestic response. The mine warfare scenario provided the stress required by the leadership of JTFA, USFF, USCGLANT, and inter- agencies in a security event to ensure timely delivery of effect.